How do I push call data from LeadDesk to SalesScreen? 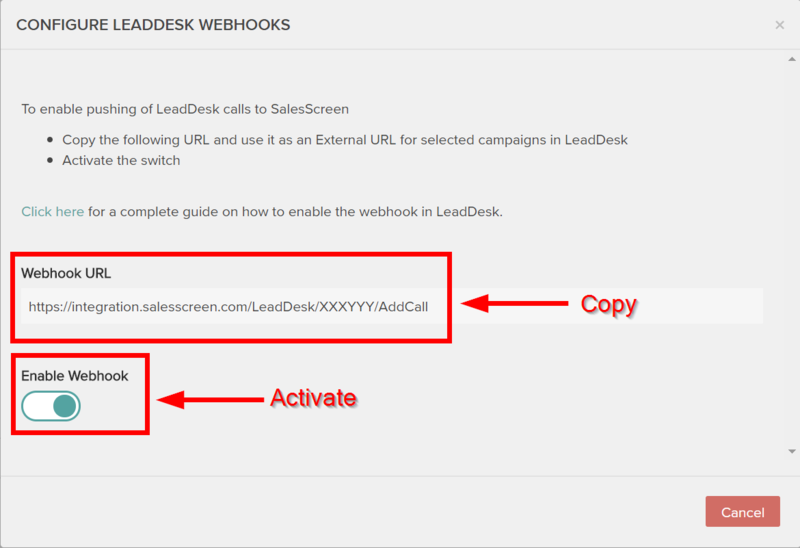 Use webhook technology to send notifications to SalesScreen about newly made LeadDesk calls. A typical integration has SalesScreen pulling relevant data from LeadDesk every 5 minutes. Thus in many cases the sales reps have to wait that long before they see their LeadDesk Deals being celebrated in SalesScreen. As a quicker way to pass data to SalesScreen, LeadDesk offers what is known as External URLs for their campaigns. An external URL is another designation for a webhook URL, which means that data is sent to the URL whenever a new record is created in the source database. NOTE: The external URLs are currently supported for Call records only. You must have admin access to SalesScreen and LeadDesk accounts. You must have at least one subintegration for the Call object set up in the LeadDesk integration dashboard. In SalesScreen, navigate to Manage > Settings > Integrations > LeadDesk. In the main dashboard, click on the rocket icon that belongs to a Call subintegration. In the popup window, you'll be presented with the webhook URL and a switch. Copy the URL and make sure the switch is activated. Sign in to your LeadDesk account and navigate to Campaigns. For every campaign you want to send call data to SalesScreen, click on it and execute Step 4. Scroll down and find the Optional Settings tab. Click on it. Finally, save you changes at the bottom of the page.